FLASH SALE: 50% off Super Early Bird tickets. Ends 4/26. Learn how you can make the most of SendGrid's platform. Get expert guidance for driving business results with email. There's so much we can do together. Get platform support or learn how to best communicate with your customers. Integrate in minutes with our email API and trust your emails reach the inbox. Find answers for an existing SendGrid account. Talk to an expert and find the right solution for you. Find resources to help you integrate and get started. There’s a new addition to the family of SendGrid libraries. 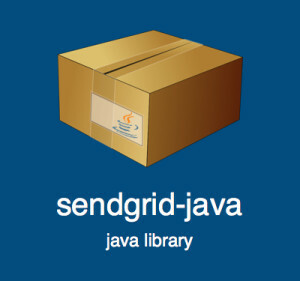 Java developers can now use sendgrid-java, a module for sending emails through SendGrid using Java. You’ve always been able to send emails through SendGrid using Java. You could use one of Java’s built in SMTP libraries to communicate with our SMTP API or you could use an http request library to communicate with our Web API. However, you had to write a fair amount of boilerplate code for both of these approaches. I recently had to build a Java application using SendGrid, and I was discouraged with this boilerplate code. As I coded the application, I started pulling pieces out into a SendGrid.java file. This evolved into the SendGrid Java library you see today. To begin, add the library to your Java application. I recommend using gradle for this (detailed instructions here), but you can simply add the SendGrid.java file to your project if you prefer. Then where you need, initiate the SendGrid object with your SendGrid credentials. Enjoy! As of writing, the library is at version 0.1.0 and is stable. If you run into any bugs file them on the issues page. Hacker in LA. I believe the future is bright. It's up to us to build it - as programmers we get a big say. Follow me on twitter @motdotla. The Full Send fits perfectly in your inbox. Coming Soon: SendGrid Supported AMP for Email! Why are My Emails Going to Spam? What is an Email Blast? What is an SMTP Server? Partner with the email service trusted by developers and marketers for time-savings, scalability, and delivery expertise.